On popular demand I bring you the recipe for the invigorating Rasam powder! 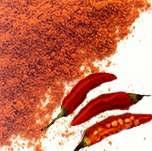 In South India, the preferred varities for red chillies are from Guntur or Byadgi regions available under the same names. The byadgi variety is less spicy, hence you would have to use 1/2 kilo if you choose this. Wash curry leaves and dry thoroughly in the sun. It should not have any moisture on it. Clean the red chillies. Its upto you whether you want to remove the cap. Place a heavy bottomed vessel(kadai) on the stove (switched on). Put the coriander seeds into the kadai. To this also add the curry leaves. Roast both together constantly stirring. Take care that it does not burn. Roast till it turns a little brown. Pour this out to a big container. (You will keep adding the rest of the ingredients after preparing them to this same container). Pour this out to the same big container as mentioned before. Put the cumin seeds into the kadai. Keep moving it around while it crackles. Stop when it changes colour a little bit. Please note that that the kadai would get pretty hot over time and ingredients could burn if you are not watching. Take 1/2 tsp of ghee and put it into the kadai. Put the fenugreek seeds into this. Roast till it becomes a brown. Now put mustard seeds and asafoetida into the kadai and roast a little. Allow the contents of the big container to cool down to room temperature. You will have with you around 1 and 1/2 to 2 kilos of Rasam powder which could last from 8 months to a year for you depending on usage. Please keep this powder in an air tight container at all times. My advice would be to pour out little quantities into a smaller box and use this daily instead of opening the big air tight box everyday. If you do not want to end up with this humonguos quantity of powder just reduce the quantity of ingredients proportionally. The main ingredient being the red chilli, if you reduce it by half for example then you will have to reduce all the other ingredients also by half. you can roast the red chillies with a teaspoon of oil. this will take away the "ghatu"(chilliness) of the chillies. hey mangala, thanks for he tip!